At first, you think it’s going to be that old cliché: men and their brown liquors sitting in leather chairs in front of fireplaces, fiddling with models of ships and speaking their “big important thoughts” out loud. And you’re not all wrong: there is a fireplace, and there are models of ships, and these are men with important thoughts: an admiral and a doctor with gray in their temples who give each other reading glasses and bottles of liquor for their birthdays. But this scene is different, somehow. For one thing, the liquor is not the amber swirling at the bottom of a glass, nor burgundy blushing in the firelight, but blue, a bottle of illegal Romulan Ale, and the doctor has carried it across light years of space and a Federation blockade in order to give it, today, to this friend. You’ve never seen Captain Kirk drink before, not really. (There was that time he got blitzed on Saurian Brandy back on the original show, but he’d been split into a “good” and “evil” half, and it was the “evil” one who did that, so it doesn’t really count). This is the future, and as Gene Roddenberry envisioned it, it’s one where we’re more or less free of the evils of drink. On starships, crewmembers are served synthehol, a sort of intergalactic version of O’Doul’s. All the flavor but none of the kick. But, like an Army doctor with a stash of Cubans in his foot locker, “Bones” McCoy comes through with the “good stuff” for his pal Jim. It’s likely this movie is, in fact, the birthplace for me of this particular boys club cliché. Born in a working class neighborhood in Lansing, Michigan, it’s unlikely I was privy to many episodes of Masterpiece Theater, or Basil Rathbone’s Sherlock Holmes adaptations. To me, drinking meant my dad and one of his friends with bottles of Budweiser on the sofa, watching Steven Seagal movies; or the men who propped up the bar at the Chinese restaurant where my grandmother worked, gaunt faces pushing cherries out of their glasses with those thin straws, clearing the way for an unmediated gulp. The velvet drapes, the leather armchairs, the wood-paneled walls, the brown liquor in the cut crystal decanter. I wouldn’t have seen any of that, not until later. But I may as well have been breastfed on Star Trek. So this, these men sipping Romulan Ale by this fire, this is the mash from which the cliché was distilled. Which is strange, really, because this scene is so unlike what you would expect from two military men sharing distilled spirits in a rumpus room. Kirk, a high-ranking official on one side of an ongoing cold war, teases McCoy about the contraband ale, but gently. He’s practical, never the kind to stand by the rules. He’s game. He pours the electric blue liquid into a tall glass—it’s not dissimilar in color to the Blue Hawaiian flavor of Boone’s Farm—and takes a sip. The expression that he makes is difficult to describe, a cross between an Elmer Fudd, “Bugs Bunny just tricked me into drinking poison and now there is fire coming out of my ears” Ah-OOOOO-Gah!, and a little girl sucking on a sour jawbreaker. But this is what makes this scene something different, what makes Kirk special. In one sense, he embodies an endless number of masculine clichés: he is brash, shoots first and asks questions later, a hopeless womanizer, and so vain that he’d rather delude himself with a ridiculous permed toupee than admit he’s losing his hair. And yet there is this look: this look of a little boy taking his first sip of a wine cooler, but on the face of a man in his 50s, a man who has killed with his bare hands, a man who has seen untold death and suffering. I had my first sip of hard liquor at 18, at a New Year’s Eve party at my first apartment. Vodka from a bottle so cheap it bent when you squeezed it, poured into a coffee mug and brazenly sipped. And while there is no denying that there was a certain appeal in the warmth, the antiseptic taste, the feeling of it tingling at the lining of my esophagus on its way down, like hydrogen peroxide poured on a skinned knee, the inescapable truth is that I drank it that way so I would seem cool. When someone asked me if I wanted cranberry, orange, or Sprite to mix it with, I would shrug and tell them, “No, this is how I like it.” In the early days of social networking—let’s go with Friendster—I listed under my interests, “Vodka.” It gave me a perverse thrill. It felt like a transgression, to say, publicly, that I liked to drink. Compared to many of my friends, I’d bloomed late. While they’d been having parties in high school, drinking and smoking pot, I stayed home, watching Quantum Leap episodes, maybe, or writing stories about comic book heroes I’d invented, or maybe watching Kirk make that ridiculous duck face on a small TV/VCR combo, the tracking lines from the second-hand tape scanning over his puckered mouth. It would be easy to take the damaged nerd posture, to complain about how I wasn’t cool enough to get invited to the parties. The truth is that I was invited. I just didn’t want to go. I didn’t feel comfortable. Friends of mine from high school have asked me about this before, and the only answer I have been able to come up with is that, for me, drinking was attached to so many things I didn’t want to become. The smell of stale Budweiser bottles. The sound of raucous laughter through a bedroom door, waking you up in the night. My father, exhausted after another shift at the hardware store, falling asleep on the couch, a can of beer balancing on his belly, his snore louder than the Western playing on the TV. 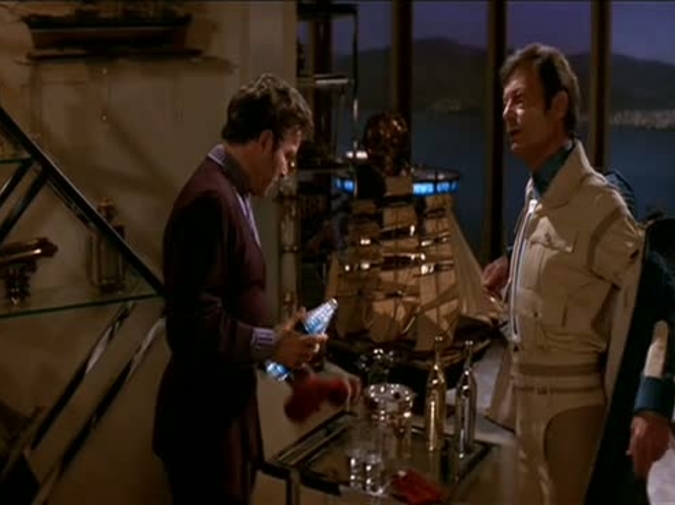 And this is, to me, what makes James Kirk’s first sip of Romulan Ale so special. What Kirk is supposed to do, what manhood demands, what cliché compels of him, is to down a sip of that blue liquor, to purse his lips only slightly—but not too much—to nod solemnly at the glass, to turn it in his hand and watch the way the light refracts through the liquid, to say, “That’s good stuff” while he lights up a cigar. But he doesn’t. He scrunches up his nose. He purses his lips. He tries to erase the taste of that awful blue stuff by sucking in air. It is almost as if Kirk realizes that there is no sense, now, after all these years, in faking it, in pretending like you enjoy the things you are supposed to enjoy. Not with his friend standing there, standing with him, both of them with more of their lives behind them than ahead. Old friends can be dangerous for the mid-life crisis set: they knew you when you were young, so they can see through that toupee, that tummy tuck, that Just For Men gel, in ways that others can’t. After all these years fighting Klingons and bedding women, only now has he learned real bravery. Sitting by the fire. With his friend. Putting on his reading glasses. Taking another sip of the drink. Pursing his lips. Realizing the end is coming. Matt Sailor was born in Lansing, Michigan, and moved to Atlanta, Georgia as a child, where he has lived ever since. He has an MFA from Georgia State University. He is a former editor-in-chief of New South and currently an associate editor at NANO Fiction. His fiction and essays have appeared in PANK, Paper Darts, Necessary Fiction, Bring the Noise: The Best Pop Culture Essays from Barrelhouse, and elsewhere. His website ismattsailor.com. His favorite movie is Hannah and Her Sisters. His favorite drink is bourbon in a wide-bottomed glass.